Huge Deck and Beach- 6/1-6/8 Special! Gulf Front-Pets-sleeps 12- all redone! 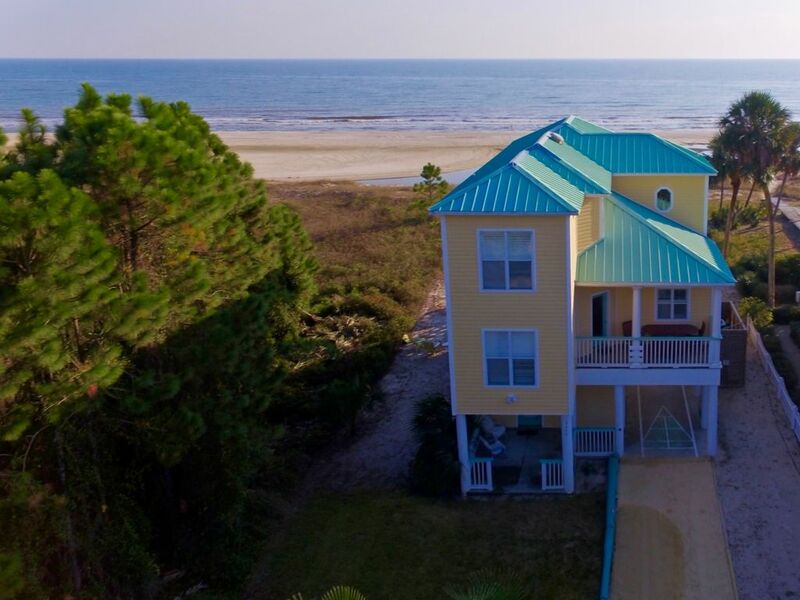 Two Palms Villa - Beachfront - Beautiful Villa- 4 BDR / 3.5 BATH pet friendly, Cape San Blas Vacation Rental , gulf front vacation home minutes from St. Joseph Peninsula State Park. We have finally completed the rebuild with some nice upgrades! It is now ready for you to enjoy. We have doubled the outdoor living space at this home. Why have a beach front home and not be able to be outside in comfort and enjoy it? We have 2 screened in porches with special railings that let you enjoy the views as well as comfortable sun loungers and lifeguard chairs. We have an open ocean front deck with 2 grills (one gas and one charcoal) with a nice dining table and barstools overlooking the ocean. To the side we have a separate deck with sun loungers to enjoy the sun and get a tan. In addition, we have included a built in 6 person hot spa, where you can watch the waves, sunset and stars! And if that is not enough we have a beautiful raised boardwalk down to the water with a viewing bench and outdoor shower at the end! It does not stop there, now for the little ones or big kids we have fun and games under the house. It has a shuffleboard court, horseshoe pit, ring toss games, enclosed private outdoor shower as well as a picnic table and chairs. We have 2 kayaks (a one seater and a 2 seater) as well as 2 stand up paddle boards with oars and life vests. These are for you to use complimentary but you must sign a liability waiver. If you find our website you will find many more photos, videos and Information about both our homes , TWO PALMS VILLA and our other house with Pool, Three Palms.) Please email us or call us and we can give you the best rate and explain any additional fees. This beautiful home sits right on the pristine Gulf beach in a low density area of The Forgotten Coast. It has a private boardwalk to the beach and fabulous Gulf views from most rooms and the upper and lower covered decks, a Jacuzzi in the master Bath, new outdoor hot tub on the front deck, 2 outdoor BBQ grill's. Like most of the area beaches, Two Palms features miles of pristine white sand in either direction. This is a vacationer's dream home with expansive Gulf of Mexico views, spacious decks and upscale furnishing and décor. No detail was left behind. Take a look at our photos you won't believe you can rent this much house on this gorgeous a stretch of The Gulf . To the land side, 2 Palms enjoys two vacant lots to the East and view of St. Joe Bay Buffer Zone with pristine woodlands and no houses or development on .80 Acre lot. We are unique since we do have a private concierge and property manager that has lived in the area for years and can be a great source of information for you. She will take care of your vacation needs and be available in a moments notice. We take pride in our home and feel all our guests are special so we treat you that way! You will find that you have a home away from home with the beauty of the natural beach surroundings. This home will be refurbished from floor to ceiling. Check out the 360 degree Video's of every room (on Website way down near the end of this page) It is only a mile from the world famous Indian Pass Raw Bar which serves the best oysters and shrimp found anywhere. You can see dolphins cavorting in the surf daily, enjoy fabulous fishing right from shore and, if you're lucky, you might catch a glimpse of a nesting sea turtle. And to top it off, Two Palms is only minutes from the majestic sand dunes and Number 1 ranked beaches of Cape San Blas at St. Joseph Peninsula and also the incredible natural beauty and wildlife of St. Joseph Peninsula State Park. See our website for all our guests comments!!! Please ask for our website address. Amenities:: Five Cable TVs, Surround Sound Stereo , Phone, WIFI, Full Kitchen, Washer, Dryer, Microwave, Refrigerator, Stove, Cookware & Utensils, Linens, Two Covered Decks, Jacuzzi Tub in Master Bedroom, huge outdoor hot tub on the deck facing the Gulf under the stars, Private Boardwalk to Beach, Covered Parking for Two Cars.Shuffle Board Court and Bocci Ball Set. Catch Fish and Blue Crabs From the shore in front of Two Palms. If you want a private pool we do have another house that we do not list, please ask for pictures. We now have 2 ocean kayaks and 2 stand up paddles (SUP) for your personal use, our compliments! Activities:: World Class Fishing and Crabbing, Boating, Walking on Beach, Horse Back Riding, Surfing,Shelling, Hiking, Bird Watching, Kayaking, Swimming, Water Sports of all kinds, Golfing. The beach is really large and wide here. There were/are 2 vacant lots to the East of our property and allows for wide angle and gorgeous unobstructed views of The Gulf of Mexico. Check out our reviews and especially our value added service with our new Concierge, Manager- Candy who lives in town. WE GOT YOUR BACK! We can not promise that there will not be a problem or issue......BUT we can promise we will provide solutions IMMEDIATELY! The lot is almost a full acre and there is only Two Palms between the highway (County Road C-30-A) and the Gulf of Mexico. Finally, on the other side of the road, is a huge Buffer /Preservation Reserve that has no houses or buildings on it. This is an extremely low density area, very private and views as a far as the eye can see. Enjoy the Hot Tub right on the deck for gorgeous views of the Gulf of Mexico, Beach and Brilliant Stars!! This is one of the few Pet Friendly Beaches in the U.S. and the beach at the State Park was rated the BEST beach in the U.S. in 2003. Fishing is out of this world with some of the best and freshest shrimp, oysters, crab, scallops and Grouper you will find anywhere!! Lastly, there are no buildings permitted in Gulf County taller than 3 stories. There are no GIANT condos on the beach. Bon Fires are permitted on the beach, car permits for driving on the beach are available and there is a very long bike path out to the State Park. Bike rentals are available. We now have 2 Kayaks available for your personal use. A Two person and One person Ocean Going kayaks and a SUP Board. We have a shuffle board court in the Car Port, a Horse Shoe Pit with backstop and a Bocci Ball set. toilet, This is a small bathroom on the grond floor. all towels and sheets are included in cleaning fee. We have indoor dining as well as outdoor dining. The outdoor dining is in a few different areas, on the screened in porch, outside on the ocean front deck and under the house by the games. 2 screened in porches that face the ocean. Shuffle Board Court, Bocci Ball, Horseshoe Pit Three Outdoor showers, 1 is private, the other two are on Boardwalk with separate hose for washing sand of pets and people. this house does not, ask about out Three Palms with a pool. nice size outdoor hot tub built into deck which overlooks the ocean. We also have a new home with a private pool, please ask about it! More availabilty since it is not listed. Our favorite beach house ever. Everything is first class including the owners and property managers. We will definitely be back.!! Lovely home situated with direct access to the beach. The new deck and boardwalk worked great for us and the dogs. Screened in porch on main floor and master bedroom was a nice feature. The hot tub, kayaks and paddle boards were nice additions to the rental of this home. Being only the second rental since the storm, there were some minor issues that came up, but Candy the Manager and Peter the owner were great in addressing the issue promptly. All in all we had a great time at Two Palms and would definitely come back. We enjoyed our stay very much and the property was great. A few minor issues came up being that it was basically up and running new since the storm but the property Manager Candy was responsive and went out of her way to get them taken care of. Candy is a fantastic! We had a very good time. The property was exactly as advertised. Our stay was very relaxing and dispite TS Gordon moving through at midweek my family enjoyed our time. My father (70 years old) and youngest daughter (5 years old) loved the hot tub. Those pesky biting insects must has gone One vacation for our trip. Though we were worried about needing bug spray I never even used it. Candy was very helpful and made sure we were comfortable and gave great information on where to eat and what to do. Great area for relaxing and fishing! Ricky, thanks for staying with us and submitting a review. You folks were real troopers with the Tropical Storm Gordon and its aftermath. The Storms can be quite thrilling and scary. Our manager, Candy, did a great job as she always does, with keeping you and your family informed about the storm. The one thing about these storms is that they come and go quickly, and it is always bright and sunny the day after a Tropical Storm or Hurricane. The Hot Tub/ Spa on the Deck is definitely a huge feature at Two Palms Villa, so great for Sunsets and Star Gazing. We are delighted that your Father and Son enjoyed it so much. I am thrilled the bugs weren’t a problem. They do disappear in the fall, BUT I don’t want to promise that they won’t be a nuisance especially in the summer. This is the Florida Panhandle, after all! The Fishing is awesome down there, and I know you are more of a golfer and didn’t get much of a chance to play, but we do have 1 course very close to Two Palms Villa, as well as several outstanding courses in the outlying area. The best thing about the house and area is the laid back/relaxed atmosphere. Is simply so very Special! This map does not show the address correctly of the property. It is on the Gulf of Mexico, beach front. It is not on the bay. it is DIRECTLY on the Gulf of Mexico. There are no other houses in Front or Back of Two Palms. It is in between the Gulf of Mexico and the highway (Florida County Road C-30-A) west of money bayou and the Raw Bar. Also there are 2 vacant lots to the East of Two Palms , which is on almost a full ACRE lot, that creates glorious vistas of the beach and Gulf. It is a remarkably large compound, extremely private and almost deserted beach that is also one of the only remaining PET FRIENDLY beaches in Florida. Vehicles are also allowed on the beach with a permit. Finally, we have a private Manager/Concierge that lives less than 1 mile away who will help you with anything you need or desire. We are very strict on the number of people the house sleeps. Extra people over 10 for this house will be subject to $500 extra.